Every child (and adult) loves to swing, we have wooden swings for toddlers and swing sets for older children, swings with slides and swings with climbing sections, something for every budget. All made from good quality wood that will last years and years. Plum Products Colobus Wooden Garden Swing Set with Double Swing and 2 Seat Glider All children lo.. 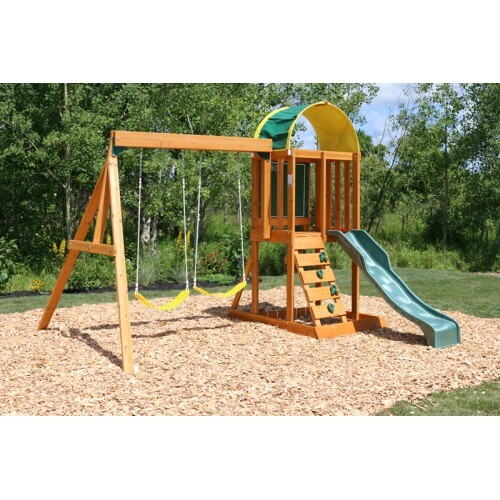 Plum Indri Wooden Play Centre A fantastic wooden play centre from Plum, Indri Wooden Climbing Fra.. Wooden Baby Swing Set Plum Wooden Baby Swing Set The Plum Wooden Baby Swing Set is ideal for y..
Kidkraft Ainsley Wooden Swing SetA staple in any child's garden the swing set is forever loved and p..
Bush Baby® Wooden Single Swing Set A great looking single wooden swing made from FSC certified pr..
Plum® Wooden Double Swing Set All children love to swing and this wooden swing sets helps .. Plum Giant Baboon Wooden Garden Swing Set The perfect swing set for helping to keep your children..
Plum® Gibbon® Wooden Garden Swing Set with Double Swing, Climbing Rope and Rope Ladder ..
Marmoset® Wooden Double Swing Set From Plum we have this double swing set, perfect for preventing.. Plum Meerkat Wooden Garden Swing Set I'm not sure the kids will stand still like Meerkats on this..
Plum® Orang-Utan® Wooden Garden Swing Set with Double Swing, 2 Seat Glider, Climbing Rope ..
Plum® Wooden Single Swing Set A traditonal and classic play item, the swing is a timele..